Hebe in front is andersonii variegata. Harv will sit and let you put hats and specs on too! Thats a great fashion statement did he knit it to? great photo,it really suits him. Truffle, what a great hat, I may need to get one, do they make them with a plastic covering as it is absolutely bucketing down here today, even I am rained off. OMG...he does suit red doesn't he!!! It would be absolutely the right gear for up here today - chilly but SUNNY - yippee! Scotland certainly deserves some sunshine. Your Golden Girls would look good fancy head gear...Lol. I think he is bewildered because we aren't sure the variety of the hebe. Do you know please ? Well look at that, now the sun is trying to shine, hope it is for you too Holly, time to rally the troops again. Lol. Hywel... as long as you aren't wearing a knitted red hat...Lol. Before I go, I think it is Glaucophylia Variegata. Hywel....I bet you look VERY handsome. Lol. Truffle looks a bit puzzled again..Lol. Hi Truffle love your new hat! He reminds me of somone. Oh, Toto... Truffle thinks he looks handsome in this hat, so I hope he reminds you of someone who is good looking..Lol. TT I have just put on a photo of my hebe,unfortunately it didn't flower this year due to sawfly but the colour of the flower is the same as yours on my label . ..actually I found the hebe photo before I read your comment above.Lol. Ha ha ha ha ha, love it. .. I can't say quite the same about Truffle..Lol. That's good TT, how would they dare misbehave in your care ..... however, what has Truffle been up to besides wearing his Vivienne Westwood collection. ... I'm having to be very vigilant ! Aw Truffle...he reminds me of Andy Capp TT...Lol! Hi Janey.... Truffle thinks he looks FAB. in this hat. :o) Lol. Oh TT, this picture made me laugh ! ...he takes it SO seriously ! his pushing forward to make sure HE wears it - NOT Conker.. and his look of disappointment when I take the hat off again.... Lol. Oh thats fantastic, cheered me up no end!! Suits you Truffle!! Haha I love it that has gone straight to my favourites. I 'killed' a hebe like the one in your picture :-( I was so busy keeping it 'moist' I drowned it ! Nice to see you can get into the garden with your boys. looks like you have a lot of rain around right now. Love it....doggie range of skis and tobbogans coming up, with doggie ski jackets as well. Don't forget - goggles, boots etc, quite an extensive range. Better check with TT the hourly rates of both Truffle and Conker and book a photo shoot!!! Is it in America that they dress their doggies up in fashionable gear? Oh now that's just dandy Truffle! What a poser! LOL..oh Truffle you are so good at this!..you have such a good face to show us how much you love being a model..LOL..!!! Hi Terra ...Jane here LOL...so THIS is the hat he offered !! Lol...it is fantastic ! Really made me smile ! BB had seen it and not told me ! I'm afraid he wouldn't be as patient a model as Truffle. He'd soon get that off, I think! He doesn't like wearing anything! ...and they have to share it...! Looking at all the comments that pooch could start up a fan club . just too cuteIwould like to give a big hug to your cute pet. I should start knitting if I were you Terra, 1 more hat each for you and Conker and perhaps a scarf for Crocus. How would you keep a scarf on him - I haven't a clue !!!!! Thanks. I've passed your hug on to Truffle. Lol. OOOOOoh my Gosh, he looks GREAT!!!!! lolol.... Alzheimer... I think Truffles has some scotish "heritage"... he just looks like a perfect sctosman!!!! I couldn't help smiling, he looks so sweet and what a trend-setter. 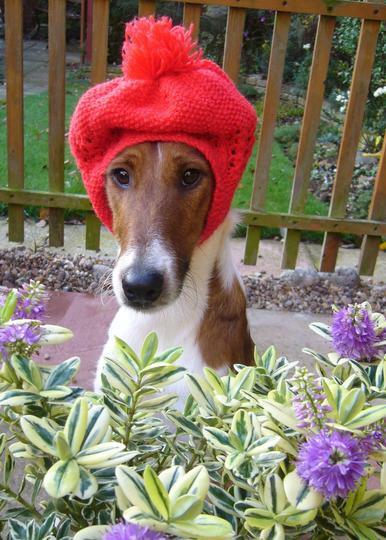 I suppose any fashion-wise dog would want to be seen in a hat like that this winter! He looks so good and patient. Yes Tt, I can see Littlewoods offering Conker a modelling contract for their catalogue. New section: Canine Head Aparell ! Yes, but at least he can still earn throughout the winter unlike us poor gardeners! We had just a couple of fireworks exploding in the neighbourhood this evening. .he he he ... I typed Big Bong Bonfire and had to alter it...Lol. Not your imagination. They now have big display fireworks in little gardens, so I suppose the displays have to use even bigger/louder ones! Thank heaven they are not allowed bonfires in little gardens any more here - this is the Municipal one...and hopefully the last - until New Year that is! Nice idea TT.....happily the party's over ....I think!!! EEK! How about Conker....any left for him? Truffle, I envy you, I would like a hat just like yours. Did you knit it yourself? Alas, I don't know how to knit. Yes, Alzheimer, our Paddy hopes there's no more till new year as well. Malt Crunchies for insulation Tt??? You could be onto something there! I can see ity on the news now........... All schools and public buildings are to have malt crunchie insulation as a safer (although a bit soiggier when it rains) alternative to asbestos!!!!!!! Make sure you get a patent on it!! What about your Divi ???!!!! No I'm not calling you a rude name, I mean your Co op Dividend card! Malt crunchies to stuff the Turkey with!!! Now that would be different! Just about to put a Flowerpot person pic up for you. I've been searching for ages but couldn't find one until recently. A bit bigger than most!! Terra - Truffle is absolutely gorgeous! A man after my own heart in his hat! Don't think my jack's would sit still long enough for that. No, I can't imagine your Jacks wearing hats for long. Lol. TT Truffles new hat nearly finished :) will send you a photo first to see if its ok. I'll keep a look-out on my email. Just how huge do you imagine are the size of Truffle's ears ? Lol. Ah - a secret hiding place for his Malt Crunchies - NOW I see why he has that chuffed expression !!!! Hi TT Conkers new hat in post you should get it tomorow. Thank you...Conker is looking out for the postman. Cold winds this week... we all need our hats. Scotkat's hat for Conker arrived yesterday... very exciting ! This photo is of species Hebe andersonii variegata. See who else has plants in genus Hebe.